Here are a few great new books that will provide decorating inspiration........ for all of you out there who love to decorate with thrift store finds. As we have a little cottage by the sea, I love this HB publication by Lisa Cregan. If you like to decorate with white, you will enjoy this book. "Living Life Beautifully" by Christina Strutt! A Pink Kitchen Dish Rack! Couldn't resist this pink kitchen dish rack I found at a local flea market. Perfect for my kitchen! A "pink" dish rack! Love all things pink! Adds some sparkle to my kitchen. Perfect for displaying my blue carnival glass & vintage china! I love to collect Vintage Prom Dresses.......but only via thrift-stores and flea-markets, as I don't want to spend very much money. Was lucky enough to find this gorgeous vintage prom dress a few months ago at a thrift-store. It has a faded pink bodice with rows of beautiful vintage blue lace on the bottom. Love! Rows and Rows of Vintage blue lace! A beautiful faded pink bodice with vintage zipper in the back! So so pretty! Catherine would look beautiful in this dress. Can't wait till she comes home so she can try it on! Paired with a vintage hanger,......love it just "hanging here or there"
Here, on my vintage clothes rack! I instantly fell in love with my new 'Jessica Simpson' lacy tank, (pictured below) that I picked up at the thrift store last week! Happy Thrifting for those cute summer items! I also love that this shirt doesn't get too wrinkled in the dryer. Perfect ruffles! I get so much use out of my RA totes! Here, my new tote hangs along with my "Bella" weekender bag and tote. Love any pattern with roses! Pictured below is one of my thrift store finds from a while ago: a pretty creme and gold canvas purse (such nice summer colors) for only $2.99. It's been so fun wearing this one lately! The gold chain part on this purse (although my least favorite part) is not too extravagant and isn't heavy whatsoever! A Shabby Chic Yard Sale! On Saturday, I held a Shabby Chic yard sale. Had a very successful day making close to $500.00. Not too shabby! Am trying to down-size a bit, which means parting with some of the thrift-store finds acquired over the years. While there are certain items, I would never consider selling, it gives me great joy to see others swoon over an object(s) that I have decided to sell.......knowing that now someone else can enjoy. Recycling pretty thrift-store finds either via handing them down to family, or selling particular items at a yard sale is fun,....... and certainly another wonderful reason why my daughter and I are "Hooked on Thrifting!" 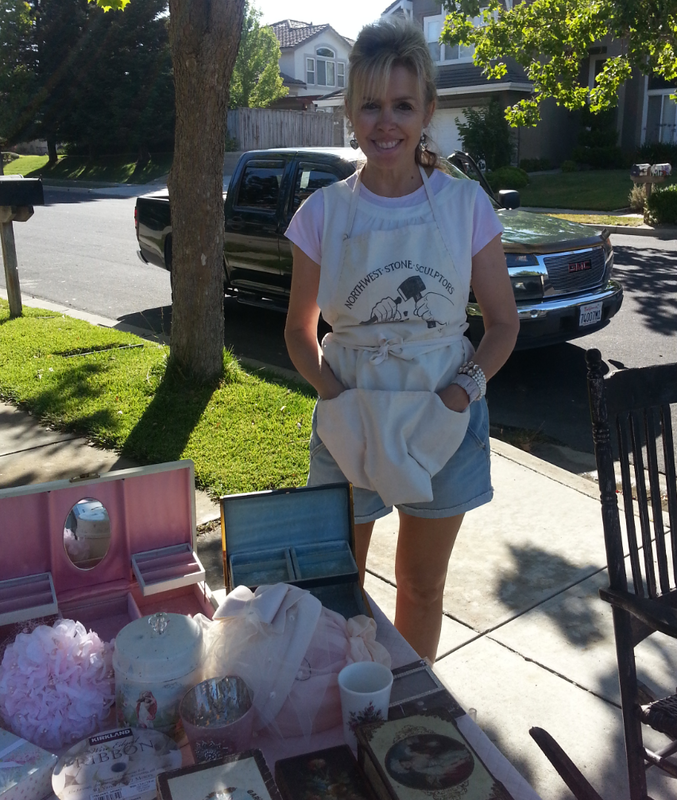 Loved making the day of many nice people......whom were so happy to find some treasures at my sale! Love this pretty blue thrift store vase. Here are a few pics with fresh flowers. So pretty! This blue vase was $2.00 at thrift-store. The perfect shade of blue! Note, the "Princess Margaret's Wedding Book" in the fore-ground. A .25 cents thrift store purchase. Love all things royal! Love these sweet little "babes"! Love! The pics sit atop the perfect (but imperfect) little blue tray I purchased at a thrift store.